Carp is a major aquatic pest species in Victoria. The classification of "introduced" reflects its translocation to Australia and Victoria, and this category is noted in the Flora and Fauna Guarantee Act 1988 (introduced to Australia after European settlement). Carp is declared as a "noxious aquatic species" in Victoria under the Fisheries Act 1995. It is an offence to possess, transport or release live carp, or use live carp (including all forms of carp and goldfish) as fishing bait. 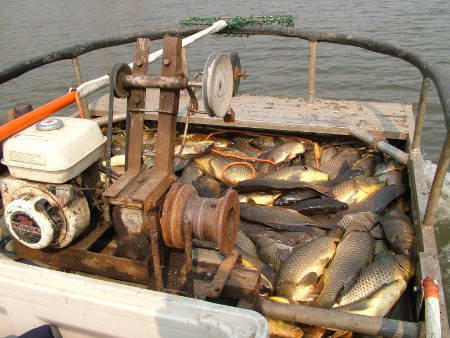 The Victorian Government therefore recognises that the use of a biological control agent to control carp has potential to provide strong environmental and community benefits for Victorian waterways. There are, however, a number of potential risks that must first be managed before Victoria can support the release of the virus. Risks may include periods of poor water quality resulting from the die off of large numbers of carp that may impact on Victorian communities and environmental values. The research program under the NCCP will address how these risks can be appropriately managed. Victoria is supporting the development of the NCCP and is providing representation on the key working and advisory groups associated with the NCCP.